Maxine Skouge was born on September 13, 1933 on the family farm in Belfast Township, Murray County, Minnesota to Max and Ethel Barrett Samp. She grew up on various farms in southwest Minnesota until 1947 when the family moved to Slayton, MN. Maxine graduated from Slayton High School in 1951. Following high School Maxine worked at the Murray County State Bank in Slayton. On April 15, 1956 she and Beuman (B.G.) Skouge were married at Christ Lutheran Church in Slayton. Following their marriage they made their home in Slayton and later moved to Alexandria, MN. In 1961 the family returned to Slayton. Beuman passed away on September 30, 2004. Maxine passed away at her home on Wednesday, August 22, 2018 at the age of 84. 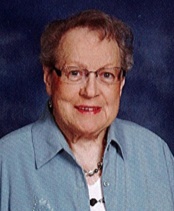 She was an active member of Christ Lutheran Church in Slayton. She was a member of the Bible Study group, the quilting circle and the Ladies Aid. Maxine volunteered many hours at Slayton Senior Dinning and served as a 4-H judge for many years at the Murray County Fair. She also was a Gold Circle Member of the Slayton VFW Auxiliary. Maxine enjoyed square dancing, cooking camping, fishing, visiting with friends and life in general. Survivors include her three children and their spouses, Jeff and Deb Skouge of Cokato, MN, Janeen and Brian Lucker of Norwood-Young America, MN, and Michael Skouge and Beckey Skouge of Bloomington, MN, seven grandchildren Jeremy Skouge and Laura Peterson, Becky Skouge, Travis Skouge, Eric Lucker and Katie Dorn, Brad Lucker and Abby Polzin, Jacob and Samantha Skouge, and Genavive Skouge, seven great-grandchildren, one brother, Ned Samp and his wife, Dottie of Redding, CA, and one sister-in-law, Beverly Samp of Shingle Springs, CA. She is preceded in death by her parents, husband, Beuman, son, Richard Skouge, 11 sisters and brothers. Christ Lutheran Church on Monday, August 27, 2018 at 10:30 a.m. with Rev. Dawn Quame officiating. The organist is Brenda Whitehead. Interment is at Slayton City Cemetery in Slayton, MN. Visitation will be one hour prior to the services at the church on Monday.